In the beautiful North York Moors National Park, converted period building. 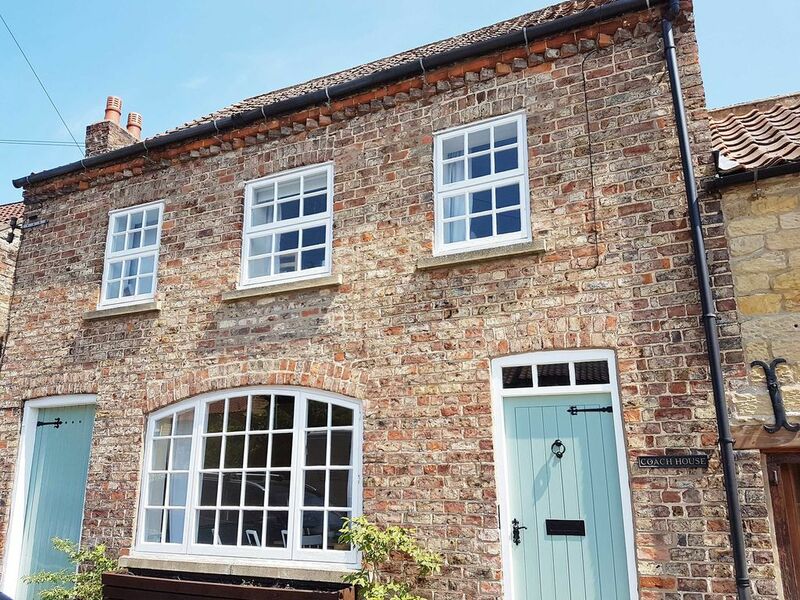 Ideal for families, mountain bikers or as a base for your outdoor activities or quiet getaway in the famously picturesque Yorkshire village of Thornton-le-dale. The Coach House is a beautifully light and spacious stone cottage with stunning period features and all modern facilities. Set in the quiet Prospect Place cul-de-sac with your own off-street parking space. Recently re-furnished, the large rooms benefit from modern furniture that provides a contemporary yet homely environment. Family friendly the house is also ideal for couples or larger groups. Included is all bedding and towels for 2 double bedrooms and a twin room, as well as a large double sofa bed in the living room, with bedding available (just ask). The Master bedroom has a king sized bed, and both that and the second double bedroom have incredibly comfortable memory foam mattresses and all bedrooms have black-out curtains as your holiday sleep is very important. There is a spacious main family bathroom with power shower, plus the master bedroom benefits from an en-suite toilet, and there is even a down-stairs toilet in the utility room. A travel cot is available with bedding and a high chair just let us know if you'd like the cot setting up for your arrival. Make your stay relaxing rather than a chore with all the modern facilities including dish-washer, wifi, large screen TV, google chrome-cast, bluetooth speaker, radio/CD/bluetooth in kitchen, washing machine, tumble-dryer and even a high spec BBQ with outdoor dining furniture. With Dalby Forest just up the road the Coach House is ideal as your base for outdoor activities whether that be strolling through the village and picturesque lanes, hiking on the moors or in the forest, heading to the sea-side (just 30 minutes drive), family cycling on the quiet bridleways up-to and around Dalby forest or serious mountain biking on the famous purpose-built Dalby forest MTB Trails. Bridleways and footpaths lead from just over the road straight into the heart of Dalby Forest without having to use the main roads (just head for Ellerburn and then follow signs for the campsite). There is also plenty of bike storage and a hose to wash your bikes. The Beck (stream) as shown in the images is just 1/4 mile from the cottage and is lined by some of the most pristine thatched cottages and gardens in Yorkshire. Myself and our children have spent many summer hours paddling and playing in the water and relaxing in the sunshine. There is even a duck pond in the village to feed the ducks. Treat yourself at Balderson's cafe, bakery and ice cream parlour. Pace Bike Shop - one of the county's leading bike companies. Several tea rooms as well as Moore's delicatessen run by two lovely Italian ladies. Large children's play park on Roxby road. Plus much more... you really will fall in love with this stunning Yorkshire village. As keen cyclists and mountain bikers ourselves we welcome cyclists and all outdoor enthusiasts. The Coach House has all the features you need as a cyclist and is located in one of England's best areas for incredible family cycling, mountain biking and road riding. A short and picturesque 1.5 mile ride on a quiet lane and then bridleway directly onto the Dalby Forest MTB trails. Secure locked bike storage room at the side of the house large enough for up to 6 bikes. We do suggest bringing your own locks too if you have more expensive bikes just for peace of mind, but this is a very low crime area. Bike wash hose and facilities. Washing machine and large capacity tumble dryer. Easy direct-from-outdoor access to the spacious utility room if it's been a muddy day and you want to clean your kit. Enjoy the trails and lanes. We are Nina and Tom Marchment, plus Evie, Deacon & Veda our 3 children. I am a midwife and baby photographer and Tom runs a bicycle business called HUNT with his brother. We live in a village near Brighton on the South Coast where Tom's business is based. I (Nina) grew up in Thornton-Le-Dale and several of my family still live here, we come back to Thornton-le-Dale every few months as we can't stay away. We love cycling and walking in Dalby Forest and the kids absolutely adore playing in the clear waters of the Beck. Plus the pubs and cafes are excellent. We hope you love visiting Thornton-le-Dale as much as we do and that you find The Coach House to be a relaxing home from home . The Coach House grabbed our attention as it was very unique being an original stone building but with spacious rooms and large light windows, meaning it feels as bright inside as it does outside. Of course the private garden was also a massive draw for relaxing and evening barbecues. Oh and we also very much appreciate the plentiful bike storage and easy off street parking. Off Street car parking space over the road owned by the house. Plus parking available on the frontage of the house as well. 8 Seat spacious dining room with high chair available and bluetooth speaker. small selection of novels and cookery books. Patio area with large outdoor dining table and chairs suitable for up to 8 people. A beautiful house, spotlessly clean and with everything you could possibly need, we all felt so relaxed and comfortable, it was like home from home. Close to all the amenities in the picturesque village of Thornton le Dale. We shall be back next year, hopefully same time and same place for another ladies reunion. Thank you Nina and family, the ladies from Leeds. The property is amazing, it had everything we needed for the long weekend. Its very nicely decorated. Perfectly placed for walking from the property. We stayed for a week in August and had a great time. The house is very spacious and well-finished. We particularly appreciated the large dining table and kitchen facilities. We even ate out in the garden one day. The Wifi and Chromecast were also handy for the odd spot of Netflix in the evenings. For cyclists the house has ample secure bike storage, and Dalby forest is nearby (4 miles to the visitor centre via road and then track avoids the £9 parking charge). Flamingo Land is only 20 mins away and the North York Moors Railway is another must-see. Two local pubs serve meals, we preferred the The New Inn which was excellent and virtually across the road. Nina was very responsive via email, and everything went smoothly. Recommended! This cottage was perfect for our family of 4, two adults, two grown children. It was comfortable, spotless and everything supplied that we needed. The town is charming and central to all that we wanted to see in the area. Nina and her family are very lucky to have such a beautiful spot to escape to!